December 2016 | New Creation Inc.
Now that winter has officially started, we are already beginning to look forward to Spring. The forecast for the womens market is looking particularly fun and colorful for this coming season. Bright coral tones continue into this year accented by more pinks and pastels. Painterly abstract patterns and geometrics will be popular and the overall color palette makes everything feel festive and bright but, not busy. Spring/Summer 2017 is looking to be a fun time for experimenting with mixing colors and patterns. Are you ready for Spring yet? Note: New Creation does not own any of the above images. They are being used as an example to show color and trend forecasting. Image sources are listed below. 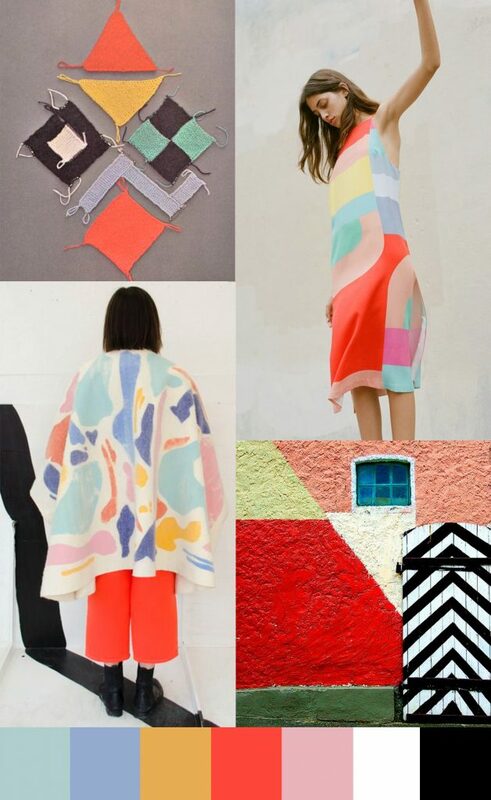 Top left going clockwise: Knit shapes: beach plum.tumblr.com, Girl in color block dress: Mara Hoffman Spring 2017 Ready-To-Wear Collection, Painted wall & door: Pinterest, Woman in printed fabric and red pants: Amber Day – Thesis – Lookbook.